No matter who you are voting for today, a vote in and of itself is a good sign for the future of energy efficiency in America. It seems the folks at Opower, the global leader in customer engagement solutions for the utility industry, has some data guru who obviously aced their stats class (didn't we all??) and found that civic responsibility breeds responsibility in other areas of life – including energy consumption. OPower's recent data analysis of energy consumers found that higher voting frequency is associated with lower household electricity usage. Their results reveal that Americans who vote more use 7- 10% less electricity. 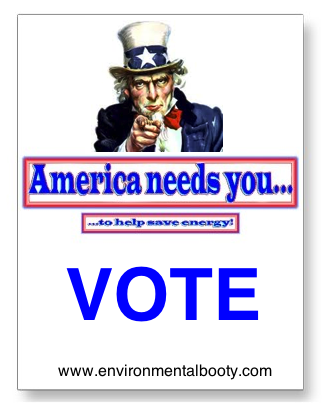 To put it simply, people who go to the polls (for either party) are more energy efficient than those who don’t.